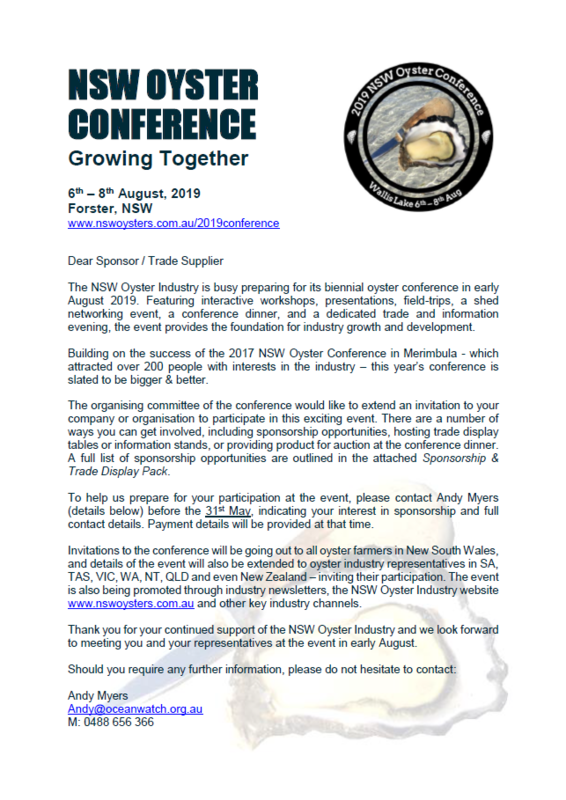 The NSW Oyster Industry is busy preparing for its biennial oyster conference in early August 2019. Featuring interactive workshops, presentations, field-trips, a shed networking event, a conference dinner, and a dedicated trade and information evening, the event provides the foundation for industry growth and development. The organising committee of the 3-day conference would like to extend an invitation to companies and organisations to participate in this exciting event between 6th – 8th August. There are a number of ways you can get involved, including sponsorship opportunities, hosting trade display tables or information stands, or providing product for auction at the conference dinner. 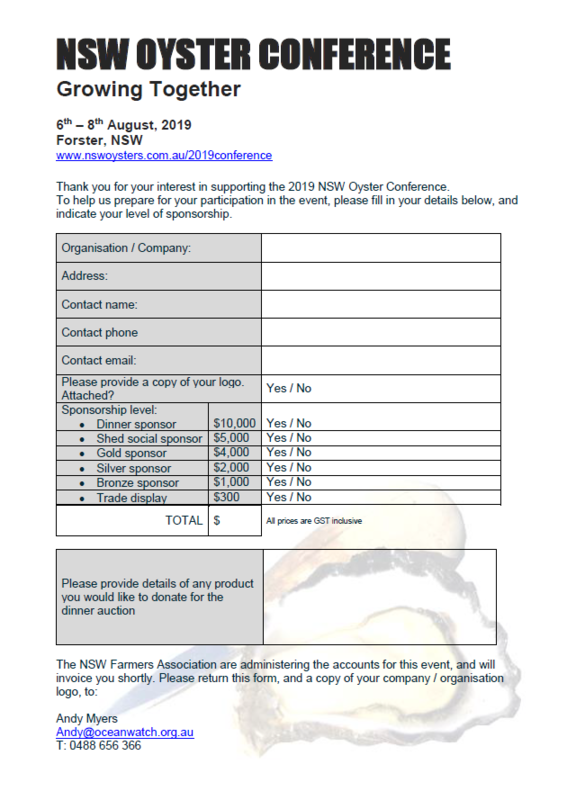 Sponsorship opportunities are outlined in the attached 2019 Sponsorship & Trade Display Pack. To help us prepare for your participation at the event, please fill out the Sponsor Details Form (MSword version available here) and return to Andy Myers (Andy@oceanwatch.org.au) by 31st May 2019. Please note that sponsorship options 1 and 2, will be allocated on a first-come, first served basis. 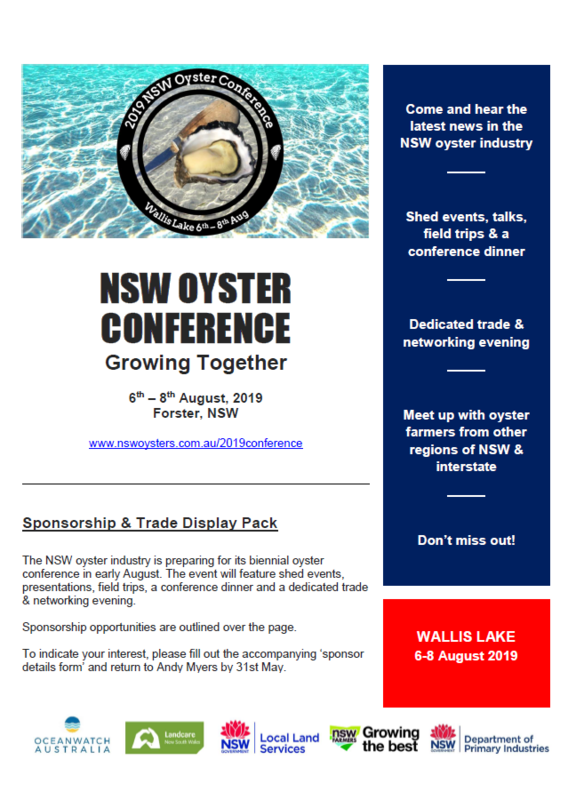 Thank you for your continued support of the NSW Oyster Industry and we look forward to meeting you and your representatives at the event in early August. Should you require any further information, please do not hesitate to contact Andy Myers on 0488656366 or email Andy@oceanwatch.org.au. OceanWatch Australia is the National Marine NRM, recognised and supported by the Australian Government. The Local Landcare Coordinator Initiative is funded by the NSW Government, and is supported through the partnership of Local Land Services and Landcare NSW.